NEW YORK -- It's the end of an era for Sears. The struggling retailer is selling its iconic Craftsman brand to tool maker Stanley Black and Decker. But for those of you who still shop at Sears and love the Craftsman brand, fear not. 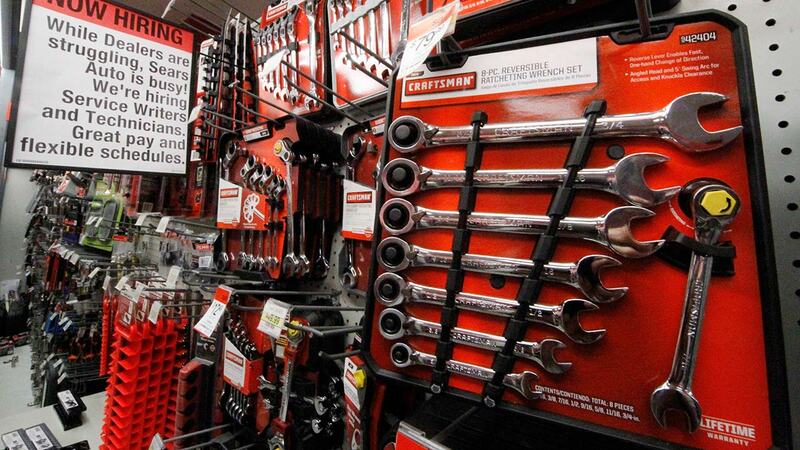 Sears will continue to sell Craftsman tools in its stores. Sears will get $525 million from Stanley Black & Decker once the deal closes, another $250 million at the end of the third year and a percentage of annual payments of new Craftsman sales for the next 15 years. That brings the total value of the deal to about $900 million. It is cash that Sears, which also owns Kmart, sorely needs. And Sears stock surged 12 percent on the news. The company has reported declining sales at its flagship stores and Kmart locations for years. It has been bleeding red ink as a result. Sears announced Thursday it will close 150 Kmart and Sears stores across the country, including two Illinois stores, which are located in Alton and Granite City. The company said 108 Kmart locations and 42 Sears locations will shut down by April. Many retailers are struggling with boosting sales as more consumers turn to online shopping. Sears CEO Eddie Lampert was forced to deny bankruptcy rumors last year due to the company's massive debt load. Sears first announced last May that it was considering the sale of its so-called KCD lineup of in-store brands -- Kenmore, Craftsman and DieHard -- in an effort to raise cash. The company said at that time it was looking at strategic alternatives for its Home Services installation and repair businesses as well. Rumors of Stanley Black & Decker's interest in Craftsman first began to circulate last October. In a statement Thursday, Stanley Black & Decker CEO James Loree said his company will increase the availability of Craftsman products through other retailers (brick and mortar and online) as well as through industrial partners. But what about Sears? Lampert cryptically alluded to the possibility that other asset sales are still being worked on. He said in the release about the Craftsman deal that "we will continue to take actions to adjust our capital structure, meet our financial obligations and manage our business to better position Sears Holdings to create long-term value." Over the past few years, Sears has also spun off pieces of its Sears Hometown and Outlet Stores division, Lands' End and Sears Canada. It also created a separate public company for some of its real estate assets -- Seritage Growth Properties. Interestingly, stock market guru Warren Buffett has personally invested in that company. To be fair though, Sears is hardly the only traditional retailer that's fallen on hard times. The rise of Amazon has hurt many older retail brands. Macy's just announced lousy results and a wave of store closings and layoffs on Wednesday. Kohl's also warned that its sales during the holidays failed to meet expectations. Both stocks plunged on the news. Other struggling retail chains, such as JCPenney, Nordstrom and L Brands, fell sharply as well.